The Great Wall was not built overnight! Before you go on your Great Wall tour learn about how and why this monumental achievement was created. All warfare must be carried out in a certain space. It is the carrier of the war. Therefore, to make full use of the advantageous topographical conditions can ensure complete victory to a great extent. Manmade defense works are adjustment and addition to the natural terrain. The Great Wall was such a defense work. By constructing a strong, continuous and lofty defense work of wall and making use of natural barriers, the ancient people could effectively hold back invasion. At the beginning of conceiving the construction of The Great Wall, the rough location was the first thing to be decided. The concrete selection of location was not written in historical records, but two points should have been taken into consideration. One was to satisfy the Courts’ policies strategically. The other was to maximally protect oneself and destroy the enemy tactically. Here we will dwell on the latter consideration. On deciding the location of the Great Wall, the designer had to take into consideration the enemy’s topographical conditions. The most important defensive strongholds of The Great Wall were first decided, and then walls and moats connecting them were further fixed. 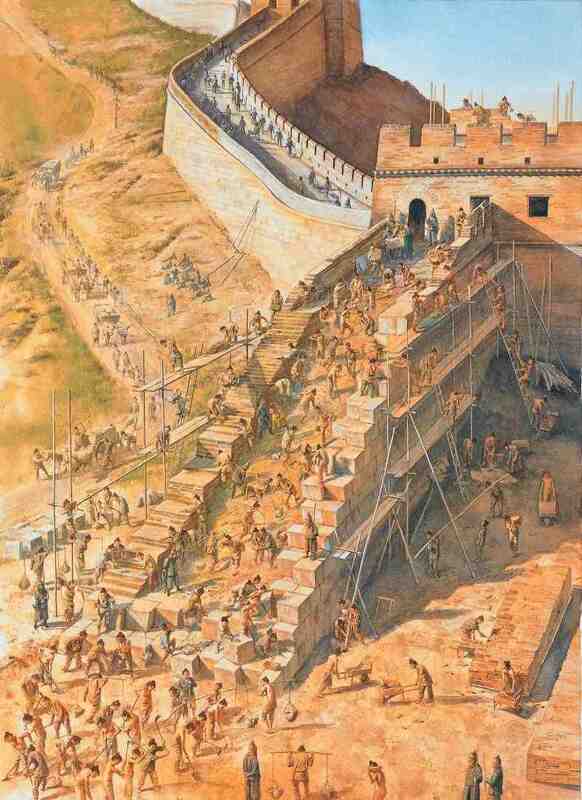 The construction of The Great Wall organically integrated the manmade defense works into a natural barrier; hence a military line of defense specializing in both offense and defense came into being. Whether or not the advantageous topographical conditions are fully used is vital to the final victory of a war. It was also a crucial point that could not be neglected by the construction commander of The Great Wall. During the construction of The Great Wall throughout the ages, it was a general guiding principle that “advantageous topographical conditions and natural barriers must be used for reasonable designing and construction of strategic passes”, which was a conclusion of The Great Wall in Historical Records, and was quoted again and again in all remarks on The Great Wall construction. The important principle was summarized in the Spring and Autumn and Warring States Periods. When Meng Tian was sent by Emperor Ying Zheng to build The Great Wall, it was formally defined and recorded in Historical Records by Sima Qian. The principle denotes that advantageous topographical conditions should be rationally chosen and measure should be suited to local conditions in the designing and construction. The locations, dimensions, building materials of The Great Wall must be wisely decided according to the local strategic importance and topographical conditions. Natural barriers such as big rivers and deep valleys were together used with the manmade Great Wall. The complementary use of such helped to improve the combat capability on the one hand, and to save manpower and material resources on the other. The location selection of certain aspects of The Great Wall clearly reflects the principle. It has been found from investigations of The Great Wall sites that examples of smart use of topographical conditions. Construction of the wall at Badaling, for example, is along the back of a mountain ridge. Since the ridge is like a very high wall, construction on it can be even unbreakable. At the same time, cliffs were also used to improve the defensive capability. In some places the Great Wall seems to be very steep from the outside, but relatively smooth on the inside. The outside was used for defending against the enemy and the inside was used for defenders to pass through. In the places where the outer cliff could play an effective defensive role, the construction would be a little trimming or an addition of some simple low walls. In the most precipitous place where the enemy was impossible to come up directly and wall construction was unnecessary, methods of using “cliff walls” and “ridge cleaving walls” were adopted. The location selection of the Great Wall in all ages involved many such methods, the aim of which was the same, i.e., to effectively keep back the enemy.